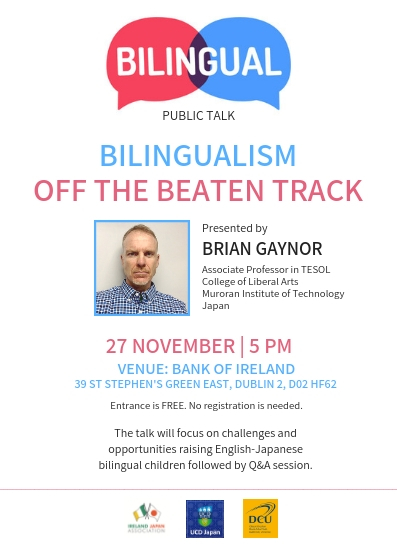 We are delighted to invite you to attend public talk ‘Bilingualism Off The Beaten Track’ by Brian Gaynor, Associate Professor in TESOL, College of Liberal Arts, Muroran Institute of Technology, Japan, and IJA member. Entrance is free and no previous registration is needed. The talk will focus on challenges and opportunities raising English-Japanese bilingual children and will highlight various measures families take to promote their children’s bilingual development. Talk will be followed by Q&A session.